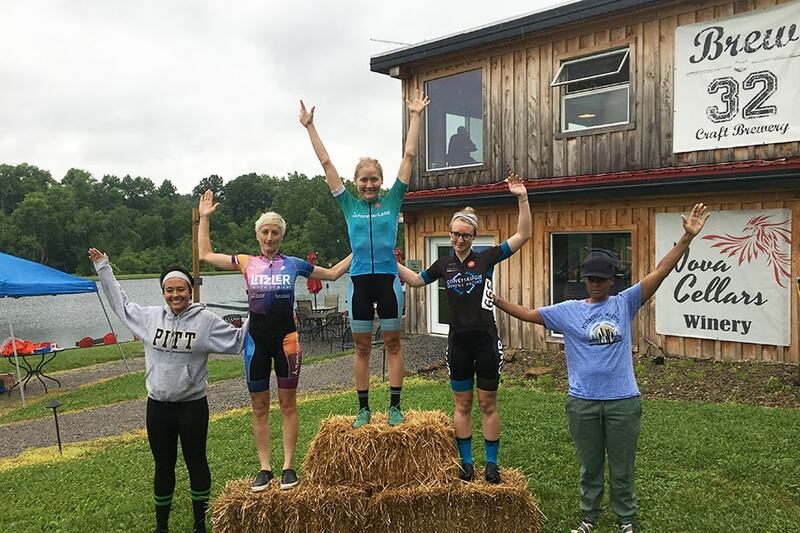 Professors Stefanie Sydlik and Shawn Litster won the Pennsylvania State Elite Bicycle Championship on Sunday, June 10, at the Brew32 Road Race in Pulaski, Pennsylvania, in Lawrence County. Sydlik, an assistant professor of chemistry and biomedical engineering, won the women’s division, pedaling the 60-mile course in 2 hours and 55 minutes. Litster, a mechanical engineering professor, won the 80-mile men’s race in 3 hours and 21 minutes. "My race finished first, so I was able to watch Shawn come across the line. Honestly, I was even more excited to see him win," said Sydlik, who rode the last 20 miles ahead of the field. "Shawn has been a great friend and mentor to me. We started riding together during my first semester at CMU — fall 2015 — and train together almost every Sunday. His wisdom has been so valuable to me as I encountered all of the trials of being a new assistant professor. To know that I shared the championship with Shawn was a very happy moment." Sydlik, who has been racing since 2013, is no stranger to competing against the best. As a graduate student at MIT, she was a member of the U.S. rowing team, which won a bronze medal at the world championships. A shoulder injury led her to cycling and renewed her interest in research. “The injury also catalyzed my interest in biomaterials, which is the current focus of my research group,” she said. The Sydlik group works at the interface of chemistry, biomedical engineering and materials science. Litster, who started racing in 1993, was a Canadian national champion in track racing in the under 18 category and a member of the Canadian national downhill mountain biking team in 1997. “The racing I was doing as a teenager got me involved with the R&D mechanical engineers at a bike company in Canada, which was what led me to doing my studies in that field,” Litster said. Litster said cycling is a team sport and credited his teammates for playing important roles in his victory, which became even better when he learned Sydlik, his friend, colleague and training partner, had won the women's race. "It was great seeing our 5-hour winter weekend training rides in the snow and ice paying off," he said. Litster’s research focuses on sustainable energy conversion technologies. He is particularly interested in research that combines electrochemistry and electrokinetics with the mechanical engineering fundamentals of fluid mechanics, heat and mass transfer, and design. Stefanie Sydlik (center) celebrates her victory atop the podium. 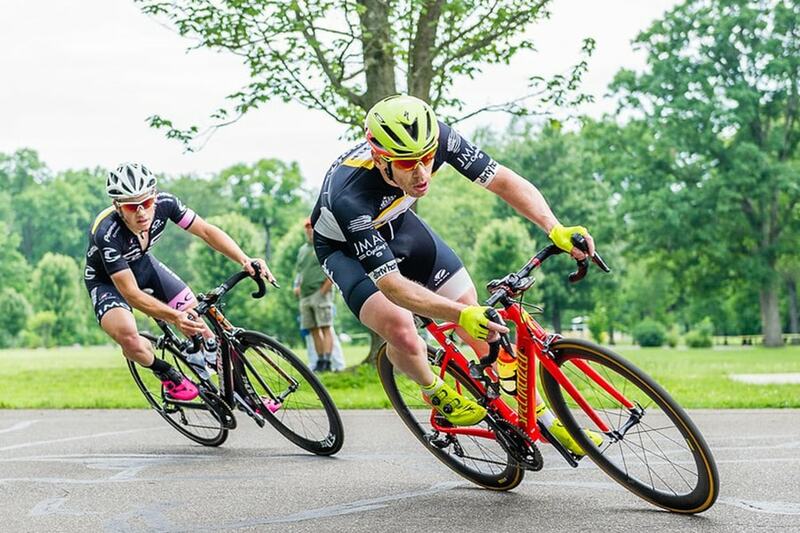 Professor Shawn Litster won the men's division of the Pennsylvania State Elite Bicycle Championship. Below, women's division champion Stefanie Sydlik celebrates her victory atop the podium.